Win Customers with Every Interaction! and in retail, banking, call center or other challenging customer service circumstances. 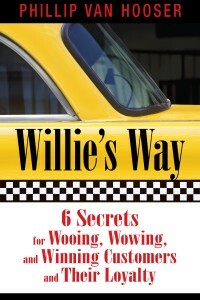 to apply Willie’s techniques to your own enterprises to build lasting customer loyalty. …the book was fantastic! My goal is to have a staff full of Willies. When that happens, I will really have something special here! Van Hooser absolutely hit’s the bulls-eye with an outstanding instruction manual about the keys to extraordinary customer service. I have no doubt that companies and customer service professionals across virtually every industry will find value and fresh new insights in the pages of this brilliantly written gem. © 2019 Leaders Ought To Know LLC. All Rights Reserved. Legal Information. Sitemap. Integrated Marketing by Prime Concepts Group, Inc.